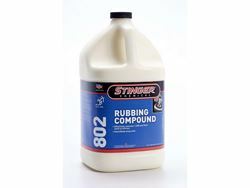 Stinger's Rubbing Compound is formulated to remove 1000 sanding scratches an orange peel fast. Great for blending new paint into old. Safe for all clear coat and conventional automotive finishes. Available in quarts & gallon containers. Body Shop Safe!